Once you know how to effectively propagate plants you will soon have many more rooted cuttings than you can use in your own gardens. At that time you can decide whether or not you should quit growing cuttings, since you have all you need, or maybe you can still grow them for another purpose. Maybe you can grow them and give them away to friends and family. They sure would like that wouldnt they? Or maybe you can grow them and sell them at a profit. Or maybe you can grow and sell them to raise money for your favorite charity. At any rate, you are not likely to quit growing them. After all, it probably took you years to learn the propagation techniques that are now working so successful for you, and it would be a shame not to use these skills. Not only that, it gets in your blood, and you truly enjoy growing things. So Ill proceed as if you are going to sell your excess rooted cuttings at a profit, and you can follow along and then do as you please with the cuttings once you have them rooted. I wont go into propagation techniques in this article since I have already produced so much information about that already. What I will discuss here is how easy it is to start a business selling lining out stock. Thats what nurseryman call the little plants that they buy to plant out in the field or in containers. Lining out stock, or liners for short. Nurseryman buy plants? You might be asking. Yes they do. Nurseryman probably buy more plants than any other group of people in the country. Why would they buy them if they know how to grow them? Because sometimes they cant grow them fast enough to keep up with the demand. Or maybe they would like to grow a certain variety of plant, but cant grow it themselves because they dont have any place to get several thousand cuttings. So what they do is buy rooted cuttings, plant them in the field or in containers, and then they either grow them on to sell, or they grow them on and just keep them around a year or two longer so they can take cuttings from them. Then once they have a supply of their own plants they can sell the ones they bought in, that are now landscape size. Does this make sense? Lets say that Mary the nursery owner buys 1,000 Variegated Weigela rooted cuttings at 50¢ each. She plants them in the field in the early spring and they take off growing like crazy. That summer she goes out and takes 3 cuttings from each plant (They need pruning away, right?). She sticks those 3,000 cuttings under intermittent mist and in about 5 weeks she has 3,000 rooted cuttings that she can plant out that fall, and she does just that. The following summer she can get about 6,000 cuttings from the original 1000 plants that she bought, plus another 9,000 cuttings from the 3,000 she planted out last fall. Thats a total of 12,000 cuttings. She continues to plant her rooted cuttings out in the field and keeps taking cuttings from them until she has all she wants to grow. From then on she can take as many cuttings as she needs from the plants that she has in the field. By now the original 1,000 plants that she bought @ 50¢ each are large enough to dig and sell, and they are worth about $8.00 each wholesale. Thats $8,000 from a $500. investment, plus she can produce as many variegated weigela as she wants without buying any more cuttings. Does it really happen this way. Yes it does. I was recently talking to a friend who grows and sells all kinds of plants and he told me that he has been buying Dwarf Alberta Spruce cuttings and growing them on and selling them. He doesnt even root any himself, he just buys 5,000 every year, pots them up and sells them wholesale. How many other nurseryman across the country do you suppose do that? To get started you can either buy a stock plant or two, or buy several hundred cuttings of the variety that you would like to sell. Instead of planting them out in the field, I would plant them in beds. Make each bed 4 wide so you can reach the center to weed and take cuttings, and place the plants in the bed 10 apart. As long as you keep taking cuttings the plants will remain fairly small, and compact. Then after two or three years dig them up, put them in pots and sell them. By then you will have thousands more coming on that you can take cuttings from. Start out slow until you know what there is a market for. Of course if you are subscriber to my Backyard Nursery Newsletter then as you know I let you know what is in short supply. Youll have to use some weed control measures if you are growing in beds, but thats all covered in my report How to Start Your Own Backyard Nursery on 1/20 Acre or Less. In the report I also cover how to sell the rooted cuttings. If you have questions for Mike McGroarty visit his website, http://www.freeplants.com and post them on the message board where you can learn lots of gardening tips and communicate with other gardeners. 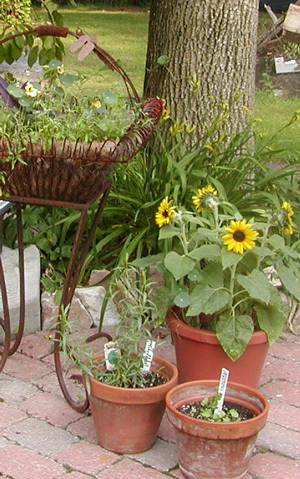 While at his website you can learn how to start your own profitable backyard nursery. If you would like a copy of Mikes booklet, The Secret of Growing Landscape Plants from Scratch, send $4.00 to: Garden Secrets, P.O. Box 338, Perry, Ohio 44081.